▸ Genuine quality antenna at a good price, with extended reception/transmission and wide frequency coverage. 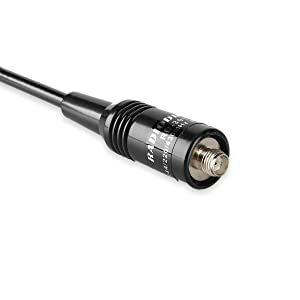 ▸ Triband: 2m 1.25m 70cm; 1/4 wave at 144MHz, 1/2 wave at 220MHz and 5/8 wave at 440MHz; Gain (relative): +2.15dBi; Watts: 10; Height: 8"; Connector: SMA Female; *Rated against typical stock HT antennas. ▸ Perfect for local repeater use. Ideal size for use around the house and yard or while hiking/exercising. ▸ Compatible with all Baofeng Radios, 5RX3, DM-5R, UV-5R/5RTP (All models), UV6R, GT-1, GT- 3/3TP/3WP, GT-5/5TP, BF-9700, BF-F9+TP, BF-888S, UV-82. ▸ This high gain HT antenna built with a flexible whip, length up to 8 inch. 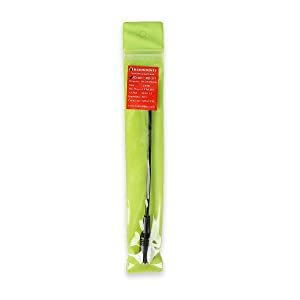 Just increase the performance on your handheld walkie talkie or wideband scanner with a Radioddity RD-301 antenna. The RRadioddity RD-301 Tri Band High Gain Antenna is for transmitting on VHF, 1.25M, and UHF frequencies. It is 1/4 Wave at 144MHz, 1/2 Wave at 220MHz and 5/8 Wave at 440MHz. 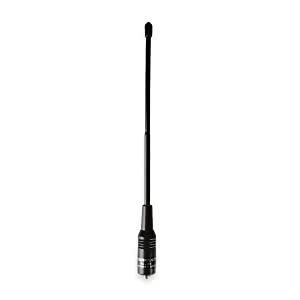 The Radioddity RD-301 is a high quality, high gain HT antenna built with a flexible whip. Increase the performance on your handheld or wideband scanner with a Radioddity RD-301 antenna. SMA female base. TH-D74A, TK-240, TK-250, TK-255, TK-260, TK-260G, TK-270, TK-270G, TK-272G, TK-278, TK-278G, TK-340, TK-349, TK-350, TK-353, TK-360, TK-360G and more.